Hello there and welcome to the September teasers for Clearly Besotted. What a great release this is going to be. It is full of cute, whimsy, elegant and beautiful sets. All of the new products will be released on the 5th September. We have some great news to share this month, Maureen/Moe has come back to the DT - yay! We also have an amazing Guest Designer this month - Yoonsun. Of course for my first card this month, I went straight for the cute. This Arctic Animals set is just adorable. It is filled with the most cutest little arctic animals and great accompanying sentiments. I started off by stamping the seal, two polar bears and walrus on to a piece of white cardstock, masking each one as I went. I added in a ground with a 0.3 Copic Multiliner. For the sky, I blended on some Tumbled Glass Distress Ink. 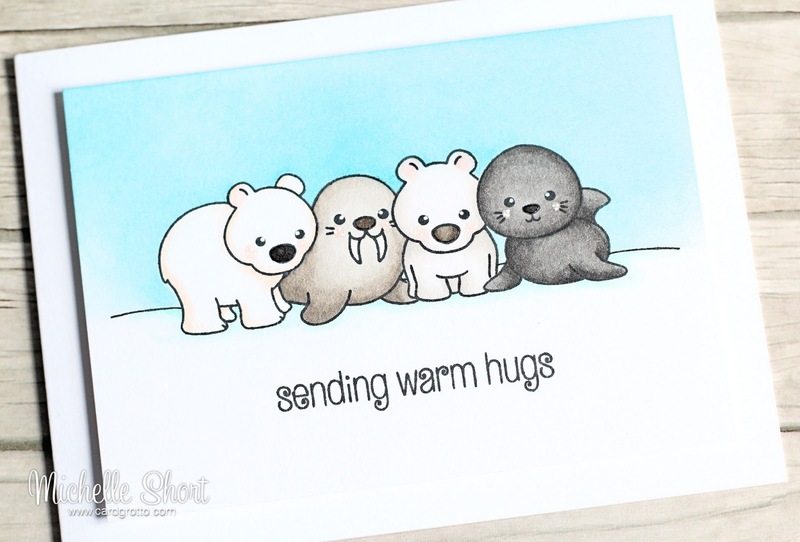 The cute animals were then coloured with Copic Markers and I stamped the sentiment below. The panel was adhered to an A2 white card base with foam. I then added a little Glossy Accents to their noses and white dots to their cheeks. COPIC MARKERS: Lt. Polar Bear: E50, T8 (nose), R00, R000. Walrus: W7 (nose), W5, W4, W3, R00, R000. Rt. Polar Bear: W7 (nose), W3, W2, W1, W0, W00, R000. Seal: T8, T7, T6, T5, T4, R00. Snow: BG11, BG10. Thank you so much for visiting me today. Please pop over to see Stephanie, who will not only have some amazing samples to share with you, she will also have links to the other DT/GDT sharing today. I hope you will pop back tomorrow for my next teaser. So sweet, cute...Polar Bears are my favorite animals. So so beautiful!! These new little CBS animals are so squeezably cute. Oh my! Those little critters are ADORABLE!! Love this super cute card, Michelle!!! Michelle, your card is super adorable!! So sweet! The little arctic creatures are so so CUTE!! Adorable card, Michelle! 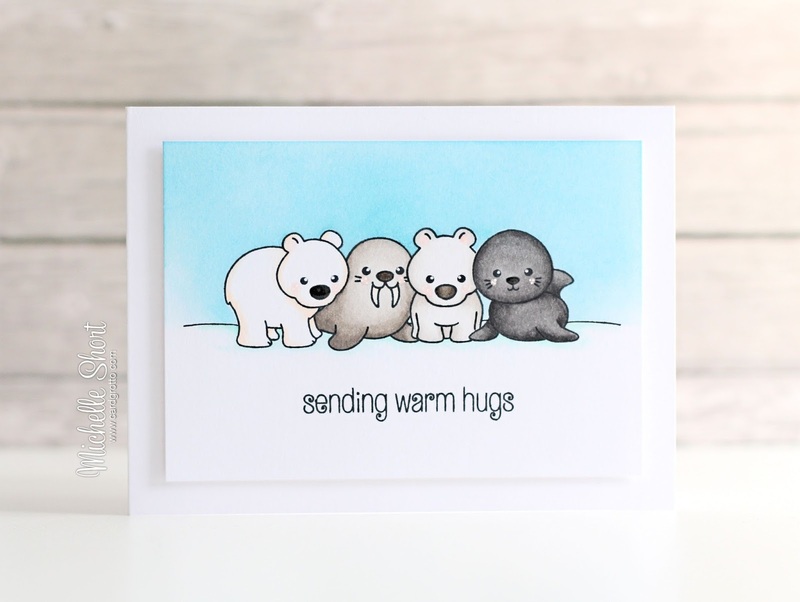 These critters are so cute and I love your card! Your colouring is great and I like the ice blue background, I think it's just the perfect colour for those fours friends. And the sentiment is also so pretty. This is just too darn cute and as sweet as can be. Michelle, I don't know what to say. If I told you, that I am a big fan of yours, would you believe it? Cute indeed. I think this set is my favourite of this new release.